Today I am focusing on this stamp set from Aunty Vera's February Kit. 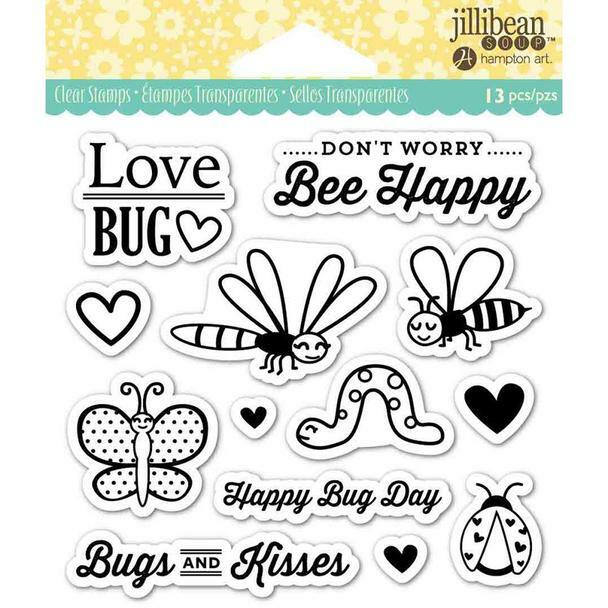 It's the Love Bug clear stamp set by Jillibean Soup and Hampton Art. I wanted to use this stamp to create a beginner's guide to stamping. I wanted to show you how I 'see' stamp sets when I make cards. I hope by sharing with you my stamping experience, that you will be able to grab any stamp set and start creating cards easily. And there are 4 hearts of different sizes ( one of them is an outline only). So lets make 5 cards, one for each of the main elements and I'll show you some techniques for making really simple but effective cards. I started by stamping out 3 lady bugs. In my mind, I wanted it to seem like the bug was travelling along the front of the card, so I used a black pen to draw a dotted line with a few whimsical swirls. Next, I used one of the smaller stamps and with my red Moment Ink pad, I stamped little hearts following the bug trail. Next, I used the same ink pad to color in the lady bugs. Next I stamped the sentiment in the open space to the left of the card. I then found some lady bug charms. One I attached to the front of the card, the other to the inside fo the card to create a bookmark which the receiver of this card can detach and use for their own purpose. And that is card one - simple use of elements and just one ink color. This card uses the second insect which is the butterfly. I repeated the imagery by stamping it out 3 times followed by the dotted lines. I wanted to take this to the next level so I used a little heart to create a pattern around each butterfly using different colors for each one. I then coloured in the butterfly with Twinkling H2Os from my stash. The sentiment was stamped on card stock and backed up with a glitter foam piece to add some more sparkle. I also found butterfly charms that fit really well on the front of the card. For this card, I stamped the worm 3 times, then added a heart at the front and end of the procession. Next, I coloured them in very simply. I stamped out the sentiment in black and then added 3 more little hearts in pink. It then occurred to me that this trio of worms were going somewhere in particular and I glanced up at my washi rack and saw this washi that says 'life is a journey' and it seemed SO RIGHT for this worm trio. I added the washi at the top. And because the washi had some green in it, I went back and created a thin line of green to simulate grass under the worms and it seemed to complete the card perfectly. Although this card looks complicated, it's really very simple. I started off by stamping the bee over to one side of the card in black ink. 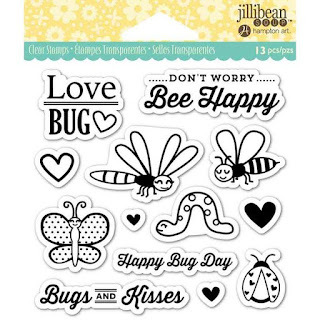 Next, I used the sentiment 'don't worry, bee happy' and I inked it up with a yellow ink pad and stamped it in a zig zag formation around the bee. Next, I used my hexagon / honeycomb stamp to fill in the areas as you see above. I then stamped the sentiment again on a separate piece of card using black ink and propped it up on the card panel with 3D foam tape. I cut some of this floral yellow paper (from my stash) to fit the exact dimensions of the card front 4.25" X 5.5" ). This card panel is a little shorter than my usual 4.0"x5.25. You will find out why in the process video (yes, another oops). So to make up for the gap, I added some black polka dot washi which actually made my panel pop even more against the floral background. This last card is another way to make a simple card!! Here, I stamped the dragon fly and coloured her in very simply (notice how some insects are coloured in and some are left black and white- these are subtle techniques that you can experiment with to draw your viewer's eye to certain elements on your card). Next, I stamped the sentiment and under that, I attached a cluster of washi in various colors, designs and widths. This is a great way to use that washi you have been hoarding, extra scraps of paper or branding strips!! I chose to put a white panel on a white card front but you can see how adding pattern paper or different color card can make a huge difference. Now that you know how to 'look' at a stamp set, go and pull out one of yours and have a play! Thank you so much for visiting, reading and commenting. As a Valentine special to all my subscribers and followers, I will be doing a random draw from the comments below and I will be sending out one of these cards. Good luck and thank you for commenting.